Congratulations to the Shaftsbury Fire Department on their order for their third Toyne Rescue Pumper. 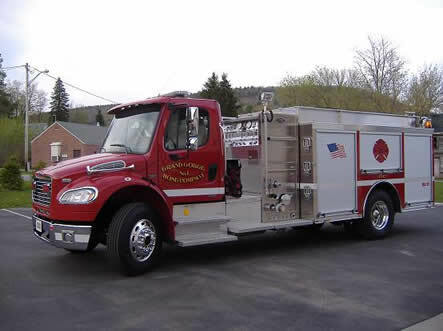 Congratulations to the Lebanon Valley Fire Department for their order for their second Toyne Tanker. Congratulations to the City of Renssalaer for their order for one new Spartan/Toyne pumper. Congratulations to the City of Hudson for their order for one new Spartan/Toyne pumper. Congratulations to the Brier Hill Fire Department for their order for one new Toyne tanker. Proctorsville has taken delivery of a new Toyne HQRP tanker equipped with an International chassis, 750 GPM Hale pump, 3000 gallon UPF tank, stainless steel body and three 10" Newton dumps. Stockport has taken delivery of a Toyne Commercial pumper equipped with an International chassis, Darley CAFS system, stainless steel body, 1000 gallon UPF tank and rescue style compartments. Hagaman has taken delivery of a new Spartan-toyne custom pumper. The unit is equipped with a stainless body, Waterous pump, 750 tank, and hydraulic ladder rack. Has taken delivery of a new Toyne 3,000 gallon tanker built on an International 7600 series chassis. The truck features a 750 gpm pump with two 4” discharges, three 10” newton dumps two electrically controlled from the cab and the valve locations. The body is full stainless steel with a UPF Poly tank. Tank level gauges are located in the cab, pump panel and the rear by the 4” tank fill. East Chatham fire department has taken delivery of a Swab Wagon walk around rescue. This Ford F 550 XL, 4x4 untit features a whelen lighting package, 1,000 pound slide out tray that is full length of the body in the center. There is upper storage of suction hose, ladders and stokes basket. 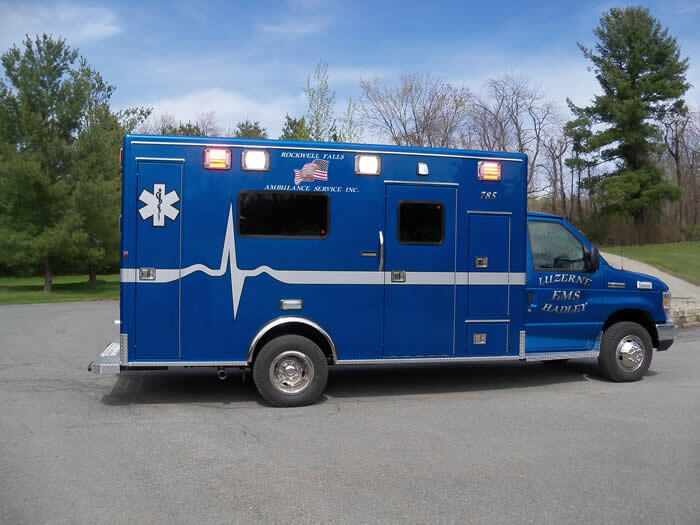 The Rockwell Falls Ambulance Service has taken delivery of a new Medix Ambulance. Hillcrest Fire Department, Halfmoon N.Y. The Hillcrest Fire Department has taken delivery of a new Fire One forestry body. Utilizing the Department supplied chassis, Fire One constructed a new body to accept an older skid unit consisting of a 250 gallon UPF tank and Darley pump. Clifton Park Halfmoon Ambulance, Halfmoon N.Y. The Clifton Park Halfmoon Ambulance Corps. has taken delivery of a Medix Type III ambulance. The has been supplied with a Ford E-450 XL chassis, a 6.8L gas engine and a Whelen Warning system. The North Hoosick Fire Department has taken delivery of a Toyne Front Mount water supply unit. The unit is equipped with a 1000 gallon UPF tank, Hale 1250 front mount pump, Hannay Hose reel capable of carrying 2500 feet of 5 inch hose, formed aluminum body and an International 4wd 7400 series chassis. The Richford Fire Department has taken delivery of a Toyne HQRP Tanker. The unit is equipped with a 3000 gallon UPF tank, Hale 750 pump, 10" Newton Swivel dump, aluminum body and an International 7600 series chassis. The Trout Creek Fire Department has taken delivery of a Toyne Transporter Tanker. The unit is equipped with a 3500 gallon UPF Ellipitical tank, Waterous BP-18 pump, 10" Newton Swivel dump, bolted stainless steel body and an International 7600 series chassis. The Springfield Fire Department has taken delivery of a new Swab Crew Walk In rescue. The unit is equipped with an 8kW hydraulic generator, Command Light LED light tower, 12 v HID body lighting, 14' walk around body and a Freightliner M2 chassis. Austerlitz Fire District, Spencertown Fire Station, Spencertown N.Y. The Austerlitz Fire District has taken delivery of a new Fire-One brush breaker. The unit is equipped with a 200 gallon UPF tank, Hale HP100 pump, a Scotty around the pump foam system and a Mitsu 4WD chassis. Eaton Fire District, Eaton N.Y. The Eaton Fire District has taken delivery of a new Toyne/Kenworth HQRP tanker. The unit is equipped with a 500 gpm Hale pump, 2000 gallon tank, three Newton dumps, porta tank rack and one large diameter tank fill. This is Eaton's second Toyne purchase. Roxbury Fire Disrtict, Roxbury N.Y. The Roxbury Fire Department has taken delivery of a new Toyne/International CAFS pumper. The unit is equipped with a 1250 GPM Hale Pump, Waterous CAFS system, 750 tank, and a bolted-brushed stainless body. Stuyvesant Fire Co. No.1, Stuyvesant N.Y. The Stuyvesant Fire Company has taken delivery of a new Toyne commercial pumper. The unit is equipped with a 1250 gpm Hale pump, 1000 gallon UPF tank, 5k Honda generator, 1600 Foam Pro system and an aluminum body. Mariaville Fire Department, Pattersonville N.Y. The Mariaville Fire Department has taken delivery of a new Swab Water Supply unit. 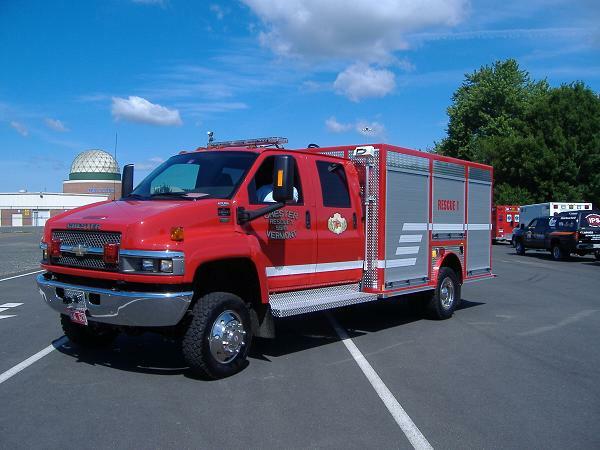 The unit is equipped with a 1000 GPM Darley Stand-Alone pump, 300 tank, Ford F 550 chassis and an aluminum body. Village of Altamont Fire Department, Altamont N.Y. The Altamont Fire Department has taken delivery of a New Toyne Pumper Tanker. The unit is equipped with a 1250 GPM Waterous pump, 3000 Gallon UPF ellipticle tank, three Newton dumps, and a stainless body. The New Baltimore Fire District has taken delivery of one Swab/Ford Brush/EMS unit. The unit is equipped a 300 gallon UPF tank, Hale 200 gpm pump, Scotty foam system, and an aluminum body. Rexford Fire District, Rexford N.Y. The Rexford Fire District has taken delivery of one Toyne/Spartan Rescue Pumper. The unit is equipped with a 2000 GPM Hale Pump, 750 UPF "L" shaped tank, 2001 Foam Pro System, and a stainless steel rescue body. 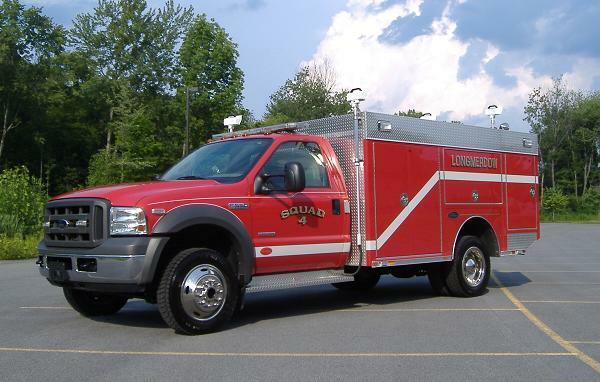 The Ouaquaga Fire Department has taken delivery of a Southern/International Pumper tanker. The unit is equipped with an 1800 gallon wet-side tank, 1000 gpm Hale Q-pak pump, 10" rear dump and a porta tank rack. Eaton Fire District, Eaton N. Y. The Eaton Fire District has taken delivery of a Toyne/Spartan CAFS Pumper. The unit is equipped with a Hale 1250 pump, Waterous CAFS foam system, 1000 gallon UPF tank, and a Bolted Brushed Stainless Steel body. Vischer Ferry Fire District, Rexford N. Y. 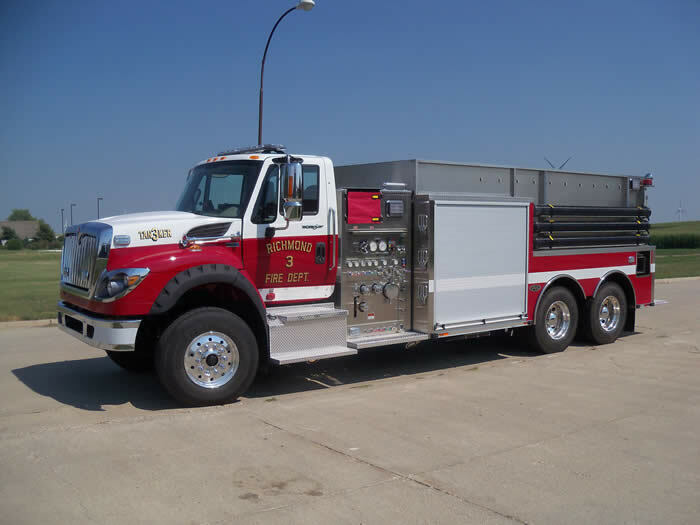 The Vischer Ferry Fire District has taken delivery of a Toyne/Spartan CAFS Pumper. The unit is equipped with a Hale 1250 CAFS Pro foam system, 1250 UPF tank, Welded stainless steel body, hydraulic generator, and a Wil-Burt Nightscan light tower. The East Greenbush Fire Department has taken delivery of a new Toyne/HME Rescue Pumper. The unit is equipped with a 1250 Hale Pump, 500 UPF Tank, Stainless Steel Body with full depth compartments and a three tool XRT Rescue system. Cherry Valley Fire District, Cherry Valley N.Y. The Cherry Valley Valley Fire District has taken delivery of a new Swab Champion Series walk-in rescue. The unit is equipped with a Peterbilt chassis, Stainless steel body, 20k generator, Wil-Burt light tower, 3 cylinder cascade system, and squad seating for seven. The West Albany Fire District has taken delivery of a new Swab Haz-Mat vehicle. The unit is built on a M2 4 door chassis, 330 MBE engine, walk through de con area with showers, MEPS 6k generator and an aluminum body. Clifton Park Fire has taken delivery of a 2009 Swab Skidder series unit. This unit is built on a 550 Ford crew cab, aluminum body, transverse front compartment and a rear 3/4 length compartment. South Kortright has taken delivery of a new Toyne Commercial Pumper. This unit is built on a Freightliner M2 chassis and is equipped with a Hale 1250 GPM pump, 1000 Gallon UPF Tank, Foam Pro 1600 Class "A" foam system and a Stainless Steel Body. The Grand Gorge Fire Department has taken delivery of a Swab Champion Series Rescue. The unit is equipped with 20' aluminum walk in body, 20k generator, Wil-Burt light tower, Weldon Multi-plex electrical system, Cascade system and squad seating for 9 members. Lebanon Valley has taken delivery of a new Freightliner Toyne Transporter tanker. This is a 2000 gallon unit equipped with 4wd, 500 gpm Darley pump, three Newton dumps all installed on an extruded aluminum body. This is the First Toyne unit for the German Flatts Fire District. The unit is equipped with a 500 gpm Hale Pump, Three remote controlled Newton Dumps, 2000 Gallon UPF Elliptical Tank, On-Spot Chains with a Bolted Brushed Stainless Steel body. This unit is equipped with a 109' RK Aerial with a 500 lb live tip load while flowing 1000 gpm. The Spartan Gladiator chassis is a LFD model capable of seating 7 members. Other options on this truck include; 1500 Hale Pump, 500 gallon UPF tank, 2002 Foam Pro System, 15k Onan generator, storage for 154' of ground ladder, Roll Stability Control, Rol-Tek restraint system and two Mars "888" lights. This is the second unit delivered this year to the department. The unit is equipped with a 3000 gallon UPF tank, a 1250 Hale Pump, Three Newton dumps with in cab controls, a Zico Porta-tank rack and a Zico Suction hose rack. The chassis is a Freightliner M2-112 supplied by Mohawk Valley Freightliner of Utica, NY. The Stuyvesant Fire District has taken delivery of a new Toyne Chevy Midi Pumper. The unit is equipped with a 500 gpm Hale Pump, 500 Gallon UPF tank, 1600 Foam Pro System and a Power Arc Warning system. The Hogansburg Akwesasne Fire Department has taken delivery of a new Freightliner Toyne Rescue Pumper. The unit is equipped with a 1250 gpm Hale Pump, 1000 gallon UPF tank, 2001 Foam Pro System, 8k Hydraulic Generator and an XRT Rescue package. The body is a bolted stainless steel construction mounted on a Freightliner M2 chassis supplied by Mohawk Valley Freightliner. The MaloneCall Firemen have a taken delivery of a new Fire One forestry service unit. The unit is constructed with an extreme duty extruded aluminum body, Hale pump and a Scotty around the pump Foam System. 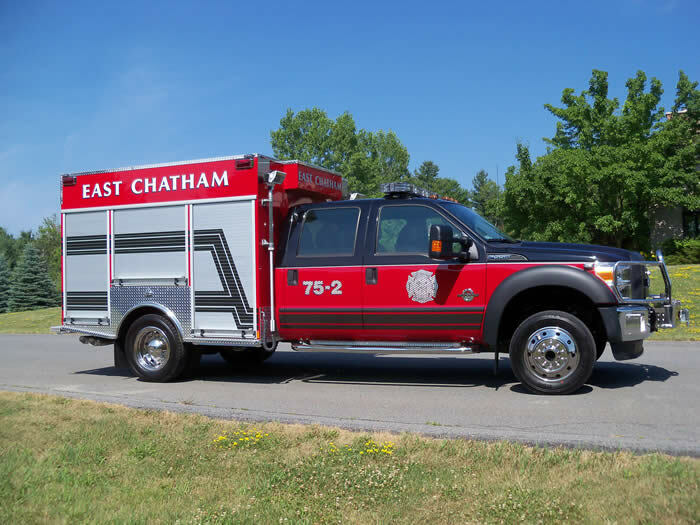 The Charlotteville Fire District has taken delivery of a new Fire-One Commercial Rescue. The unit is constructed on an International 4400 Series chassis with an extruded aluminum body. Perth V.F.C. has taken delivery of a new Toyne Transporter Tanker. The unit is constructed on a Kenworth T300 2 door chassis with an extruded aluminum body. THe apparatus is equipped with a 2300 gallon UPF tank, 3 Newton Dumps, and a Hale 500 gpm pump. A new Toyne Commercial pumper has been delivered to the Germantown Fire District. The unit is equipped with a Freightliner M2 chassis, 1250 Hale Pump, 1250 UPF tank, 1600 series Foam Pro system, 10" Newton Dump, Honda 5kW generator and automatic tire chains. A new Toyne Quick Attack unit for the Town of Longmeadow F. D. The unit is equipped with a Ford 550 4wd chassis, a Hale HP300x pump, 300 gallon UPF tank, a Hale Foam Master class "A" foam system and a Honda 5kW generator. A new Rapid Fire Rescue for the Chester Fire Department. The unit is equipped with a Chevy 5500 series 4wd chassis, a Hale HP200X pump, 250 gallon UPF tank,Scotty Foam System, Smart Power 5kW hydraulic generator and an XRT rescue package. The Grand Gorge F. D. has taken delivery of a new Toyne commercial pumper. The unit has a top mount Hale 1250 pump, 1000 gallon UPF tank, through the body ladder storage and a stainless steel body. The Freightliner M2 chassis was provided by Mohawk Valley Freightliner. A new Toyne pumper for the Munnsville Fire Department. The unit is equipped with an International 4400 series chassis, 1250 Hale Pump, 1250 gallon UPF tank, 10" Newton Dump all on a stainless steel body. A new Rapid Fire CAFS unit for the Pleasantdale F. D. The unit has a Snuffer 70 CFM CAFS system, a 5kW Yamaha generator, portable Warn Winch on an aluminum body. The chassis is a Ford F-550 four door chassis supplied by Skinner Ford. A new Toyne Transporter Tanker for Westernville NY. The unit has a 2750 Gallon CFP Tank, Hale AP50 PTO Pump, Zico Porta Tank Rack on a stainless body. The chassis is a Freightliner FL 120SD supplied by Mohawk Valley Freightliner. A new Rapid Fire Midi Pumper for Altamont NY. The truck features a 500 gpm pump with a 300 gallon tank and a foam cell. The chassis is 5500 Chevy with seating for four with three SCBA seats. The body is aluminum with ROM roll up doors, foam pro system and a Weldon V-Mux system. A new Rapid Fire 3000 gallon tanker for Moira, NY. This is on a Freightliner M2 chassis and features a 3000 gallon UPF wetside poly tank with 500 gpm PTO pump, three 10" Newton dumps and a Power Arc lighting package. The pump is from Darley. A new Toyne 2000 gallon tanker for Endinburgh, NY. This is on an International 4400 chassis and features a 2000 gallon UPF poly tank with 500 gpm PTO pump, three 10" Newton dumps and a Code 3 lighting package. The pump is from Hale. A new Toyne 2300 gallon tanker for Castleton, VT. This is on a Kenworth chassis and features a 2300 gallon UPF poly tank, three Newton dumps, porta rack and a Code 3 lighting package. The unit is equipped with a Hale HPXB-300 pump. New brush truck for Arvin Hart, Stillwater New York. This is on a F350 Ford and features a 150 gallon UPF poly tank with a foam cell , front brush guard and winch and a Code 3 lighting package. The pump is a Waterous high pressure pump. This is a new Snuffer CAFS quick attack truck designed to protect both the suburban and rural lake area in the district. It features a 300 gallon water tank 30 gallon foam tank, 140 CFM compressor and a 250 gpm Darley pump. The chassis is a Ford 550 with a 84 cab to axle. New Rapidfire truck for Alburgh, Vermont. This truck is built on a 5500, 4x4, Chevy, featuring an Allison transmission as well as a Duramax diesel engine. The body is extruded aluminum and has a 500 PTO pump with a 140 CFM compressor for the Snuffer CAFS. The CAFS is plumbed to a 1 1/2" crosslay, a 150' reel of 1 1/2" Reel-Tex hose and a 2 1/2" discharge. The truck has a 5 KW Westerbeke diesel generator with 2 Hannay electric rewind reels for 200' of 10/3 wire, two rescue reel for hydraulic hose, one reel for 100' of are hose and the 150' of 1 1/2" hose. Total of 6 Hannay reels. The unit is built for a two man operation during the day. It can effect a quick knock down with the CAFS as well as vehicle extrication. Colebrook, N. H. has taken delivery of a new RapidFire 16' rescue on a 5500 Chevy. The unit features On Spot chains, XRT hydraulic system to power the 5KW generator as well as the rescue tools. 3 SCBA seat are mounted in the rear seating area. These are full SCBA seats that do not interfere with the rear heater. The warning package is a combination of Power arc and Code 3 LED's. V.R.S. mounted the rescue tools on the rear slide out tray. Twins for Shaftsbury! Two new Toyne pumper's are now in service. They feature 1500 gpm Q-Max pumps, 2002 Foam Pro systems 1,250 gallon poly tanks and 30 gallon foam cells. The bodies are bolted using marine grade brush stainless steel. All of the plumbing and valves are stainless steel. The lighting package is LED from Power Arc and all the lettering is hand gold leaf! New RapidFire EMS vehicle for the Springfield Fire District. This unit is built on a Ford 550, 4X4, crew cab chassis. This is a full-extruded double wall aluminum body. Features of this truck are: Heavy duty slide out trays from Slidemaster, the tray in the front transverse compartment can slide out 70% left or right so you can work off either side of the truck, also slide out tilt down trays and rear command desk. Under the desk is storage for both a stokes basket as well as backboards. A locking drug box is located in the left rear compartment. The unit has a Power Arch light package. Vehicle weight without equipment is 11,100 pounds. This truck is built on a F 350 extended cab Ford with an aluminum extruded body featuring Power Arc warning lights and ROM roll up doors. As you can see the cab is plenty big. This is a walk around rescue on a Ford F 450 4x4 which has a six bottle cascade system with a frag tank and panel. Yarmouth Maine has a new Diamond series body from V.R.S with a Snuffer CAFS skid. The unit is mounted on a 550 Ford with a 300 gallon poly tank and a single line CAFS from Snuffer. Greenport Fire District gets a new Toyne pumper tanker. Becrafts Fire company has taken delivery of the second truck from V.R.S. Sales. This is a Toyne with a stainless steel bolted body mounted on a Spartan gladiator chassis. The engine is a Cummins ISM 400 hp. The pump is a Waterous 2000 gpm with a 2,500 gallon tank and three electric controlled dumps. These are controlled from the cab and the dump locations. the pump panel is enclosed in the cab. North Hoosick gets a new GMC 4-wheel drive rescue truck. The truck features a 12 foot walk around aluminum extruded box with an XRT Hydraulic rescue system. The system features a Harrison 5 KW generator and two reel for the rescue tools. The generator and the two reels can be used at the same time. The lettering was done in house. This is the second truck purchased from V.R.S. Sales in the past three years. This is built by V.R.S. and features a 2,000 gallon UPF poly tank, three electrically controlled Newton dumps which are controlled in the cab or at the dumps. The body is a fully aluminum extruded body with a 500 gpm Darley pto pump. Facts: This truck is 108" tall at the light bar, 25 feet long and weights 35,080 pounds. It is built on a 7400 series chassis. The truck has two rear direct fills that use the fireman's friend valve which has an internal clapper. It also has Onspot chains. The Brimfield Fire District. has taken delivery of a new 12 foot walk around rescue mounted on a 5550 GMC crew cab. The unit features a Power arc light package, many shelves and trays 110 volt electric system along with 12 volt telescoping light on front of the box. There are receivers front and rear for a 9000 pound Warn portable winch. This is an aluminum extruded body. A new quick attack truck from V.R.S.Sales on a Ford 550 has been delivered to the Greenport Fire District in Hudson New York. This unit features a Snuffer C.A.F.S. with a 500 gpm pump, 140 cfm compressor and a 1600 Foam Pro system. The truck has an extended front bumper for a remote controlled Stang gun and a Hannay electric reel mounted on top of the truck with 150 of 1 1/2"
Westford, New York has taken delivery of a new EMS vehicle on a F350 Ford with an extended cab. The body is an extruded aluminum and features a command board in the rear compartment. The unit is built on an HME chassis with a body built by Toyne. It is a bolted stainless steel body with a 1250 Hale Q Flow pump and a 1250 Poly Tank with a rear 10" Newton Dump. The ladders and Fol Da Tank or stored in rear slide in compartments. The truck is a Toyne built on a International 4 X 4 chassis. It features a 1250 Hale pump with a 1250 tank, 2002 Foam Pro system and an aluminum extruded body. Edgewater Park takes delivery of a new Bodyguard body from V.R.S.Sales. The unit is built on a GMC w series six man chassis. The truck carries 200 gallons of water with a class "A" foam system, 500 gallon Hale pump, an aluminum extruded body with Robinson roll up doors. The over all length of the truck is 20 feet to fit in their existing station. Edgewater Park is one of the ten volunteer fire departments in New York City. The picture of the 1964 Willys Jeep was built by Howe for Edgewater Park and purchased by the Shakerley's. This is a new Fort Garry pumper tanker built on a International 7400 series chassis. It features a 1250 Hale pump, 1,500 gallon poly tank, rear 10" Newton dump and a side portable tank storage. The body is aluminum and holds 2,000 feet of 4" hose. The unit is built on a Ford 550 and features a Bodyguard Diamond series body. There are several 100% slide out Slide Master trays for their rescue tools, storage for four SCBAs and four bottles. It has a Snuffer 4590 compressed air foam system with a 360 gallon water tank. The truck was designed to handle EMS and auto extrication and first out for calls. Brier Hill Fire District has taken delivery of a new Fort Garry stainless steel pumper. The unit features a 1250 Darley pump 1,000 gallon tank and a 1600 foam pro system. This is a rescue with a crew area behind the cab with seating for three. The truck is built on a 550 Ford and has several slide out tray and tool boards. Note the size difference between the cab over GMC and the Ford, both trucks carry six people. Charlottville gets new pumper tanker from Fort Garry Fire Trucks. Picture show the new truck during the final inspection. The chief and Asst Chief take a rest during the inspection. The new truck has a 1250 Waterous pump with seating for 6 with three (3) SCBA seats in the rear. The rear enclosure is fully air conditioned and heater. The tank is 1800 gallons with a rear 10" dump. The chassis is a 7400 series International. New tank and body mounted on a used 1984 Kenworth chassis for the Paul Smiths-Gabriels Fire Dept. The body is an aluminum extruded body and the tank is from United Plastics. This truck is being finished. The Westport Fire District has taken delivery of a 16 foot non walk in aluminum rescue. The truck features ROM roll up doors, a Honda 5,000 watt generator, Fire Research lights, bottle storage for 16 bottles and several roll out trays. The unit is a Bodyguard, Responder series built by V.R.S. Hensonville has taken delivery of a new Fire One brush truck. The unit is built on a Ford 450, 4X4 chassis. The body is an all aluminum Brush Master body with a 300 gallon tank and Hale pump. This is our first Fort Garry delivery to Groton, VT sold by Chris Eaton of Williamstown. The truck features a five man cab with a fully enclosed top mounted pump panel. The body is aluminium. with a 1,000 gallon tank and a 1,250 Hale pump. The truck was sold for $149,000.00. The picture in front of the station shows their 1952 GMC Sanford. Is a non walk-in rescue built on a 550 ford 4x4. The body was built by Fire One with the final assembly by V.R.S. Sales. It features slide out drop down trays, bottle storage for 10 SCBA bottles and fire research 300 watt 12 volt lights. This truck sold for under $70,000.00 and is the departments second truck from V.R.S. Germantown New York has received a new 18 foot rescue from Boise Mobile Equipment on a Kenworth chassis. The truck features a 25kw pto generator, Will Burt light tower, cascade system with a control panel and duel tank fragmentation container. The truck also has a receiver hitches on all four sides and a 5,000# portable winch as well as a 220 volt hydraulic power plant with three reels. The Speigeltown Fire District located outside of Troy New York has taken delivery of a new Fire One quick attack unit sold by V.R.S. Sales. The body is a fully extruded aluminum body with Robinson roll up doors. The cab is set up for SCBA seating in the rear. The skid unit features a Hale diesel pump with a class "A" foam system and a 300 gallon poly tank and a 15 gallon foam tank. The truck is designed for quick response for EMS calls, car and brush fires. This is a new compressed air foam unit built by Snuffer. This truck is designed by V.R.S. Sales to handle car fires in the multi story parking garage as well as outside fires at the airport. The CAFS unit is set up to use class "A" foam and has a 150 gallon poly tank and a 10 gallon foam tank. This is a small compressed air foam truck from Boise mobile equipment. It has a 350 gallon water tank with a 15 gallon foam tank. The pump package features a 110 GPM pump rated at 150 PSI and a 35 CFM compressor from Van Air. The foam proportioner is from Hale. The body is all aluminum with roll up doors. As you can see from the rear picture there is plenty of room for storage. The chassis is a 550 Ford. This is a 2000 gallon semi-elliptical aluminum tanker. The truck features a 550GPM CET pump that is plumped to the tank with a pre-connect to the rear of the body there are three electric 10" newton dumps controlled for the can as well as by the dump itself. It is on a GMC top kick chassis with NA 300 CAT engine and an Allison transmission. This is the third truck purchased from V.R.S. Sales. This is a 4x4 international built by Boise Mobil Eqipment. It Features a compressed air foam system a 500 GPM PTO pump and a 500 gallon tank the body is aluminum and the foam system is built by Boise with a 2001 foam pro system. This is a Boise Mobile Equipment truck on a 4800 4x4 international. It features a 1250 GPM Q-Flow pump aluminum body and a 2001 foam pro system. The ladder rack is a zico quick lift and there is a front suction. This is built by Boise Mobile Equipment and has 185 CFM compressed air foam system. The body is stainless steel with a 1,000 gallon rectangular tank with full depth compartments. The pump is a midship mounted 1,250 with the pump controls in the left rear compartment. The overall length of this is 26'. The chassis has a 10" extension with two SCBA seats in the cab. This is the third unit purchased from V.R.S. for this department. This is a 17' stainless steel walk-in rescue from Boise Mobile Equipment. It has a 25 KW generator interior seating for 6 members with individual fold up SCBA seats. The chassis is a FL-70 purchased locally from Capglo Truck in Utica. It features an air ride suspension. This is the departments second Boise and third truck from V.R.S. This is a 750 G.P.M. water supply pump built by Boise Mobile Equipment. The chassis is a Ford 450 with a 84" CA. The body is aluminum and has a hose bed capacity of 1,700 feet of 5" hose. The side compartments are built to hold two portable pumps and strainers. The truck does not carry any water. Seagrave full stainless steel cab and body with a series 60, 430 HP engine, jake brake and Allision transmission. The pump is a 1,500 waterous with a 500 gallon tank. This truck was built by Boise Mobile Equipment and delivered in August, 2000. It features an aluminum body, 1000 gallon rectangular tank with full depth compartments. The hale pump is a 1250 QSMG with electric MIV valves. The chassis features a 430 hp cummins with a jake break and a 4060 transmission. This unit is stationed in the west end firehouse. This is a seagrave 6 man stainless steel tilt cab and stainless body. It features a 1500 waterous pump with a 1,250 water tank. As well as a hydraulic ladder rack, it also has a drop down fol da tank bracket and a 10" newton dump. The chassis has a 360 hp detroit engine and a 4060 allison transmission. This is a very unique truck in that it is only 30' long and has a 1,500 gallon tank. It features an aluminum body 1,250 Hale Q-Flow pump and a 2001 foam pro system with a 20 gallon foam tank. What makes this truck work is the location of the pump panel. The pump is still midship mounted but with the controls at the left rear compartment. This allows us to move the tank two feet closer to the cab and give us larger compartments. The chassis is a 4900 320 HP with seating for five. The truck was built by Boise Mobile Equipment. This is a Boise Mobile Equipment C.A.F.S. pumper. The truck features a 1250 hale pump, 1500 gallon booster tank, 10" Newton dump, 2001 Foam Pro system, and a 185 CFM compressor. The body is aluminum with full height with a top mounted pump panel. Compartments left side. This is a stainless steel pumper with a Hale Q-Flow pump. 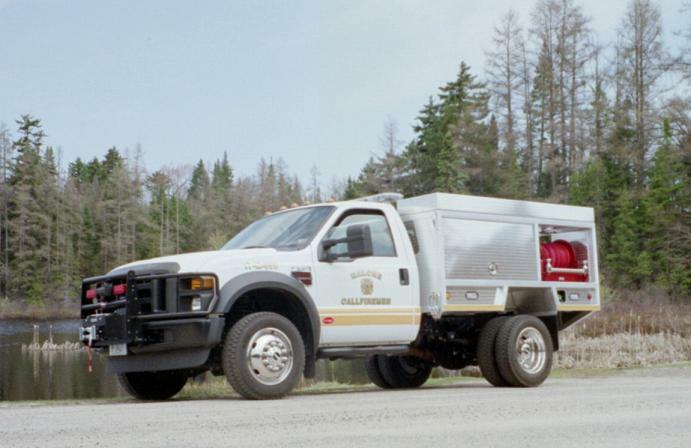 This truck was built by V-Tec of Vermont and features a bolted body. It is top mounted controls and is on a 4900 sseries international with a 300 HP engine. This is a compressed air foam truck with rear mounted 1,000 gallon per minute pump and a 500 gallon tank. The Truck is designed for quick attack and has full depth compartments. The chassis is a 4800 4x4 international. It was built by V-Tec of Vermont. This is the new mini pumper for the Rotterdam Fire District #2 in Schenectady New York. The truck features a 500 gmp Waterous pump with a 300 gallon tank and a 1600 Foam Pro system. The truck was built by Boise Mobile equipment on a 550 Ford with four wheel drive.